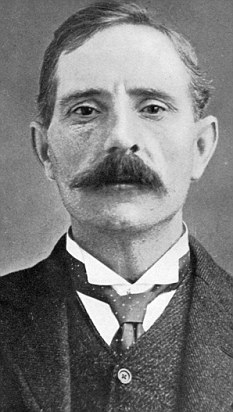 On this day in 1915, serial uxoricide George Joseph Smith was hung by the capable John Ellis at Maidstone Prison in the UK. Smith had committed three murders and various forms of larceny as well; he’d earned his noose several times over. Two things tend to trip people up when they’ve seemingly committed the perfect crime: either they brag about it to impress others, or they repeat the crime using the same methodology as before, since it worked so well the first time. Either of those actions greatly increases the risk of the criminal’s getting caught. Smith made the latter mistake. He was in a sense a victim of his own success. Smith was born on January 11, 1872. His criminal record began when he was sent to a reformatory at nine and served a seven-year sentence. In young adulthood he was in and out of prison on theft- and fraud-related convictions. His complicated marital career began when he married Caroline Beatrice Thornhill, a domestic servant, in 1898. Smith persuaded her to steal from her employers. Caroline served time in prison as a result, and implicated her husband, who got two years for his role in the thefts. After George Smith’s release, Caroline thought it wise to put a few thousand miles between herself and her estranged husband, and so she left the UK for Canada. She never filed for divorce, however. Smith remained legally married to her for the rest of his life, so none of his numerous other marriages were legal. The guy wasn’t good-looking, but he could charm like any good con artist. A year after his marriage to Caroline, Smith bigamously married another woman. He cleaned out her saving account and then deserted her. Between 1908 and 1914, he married no fewer than seven additional women, usually under an alias, and deserted most of them after a short time, sometimes only a matter of days — but not before he helped himself to their possessions and bank accounts. Smith initially limited himself to scamming gullible spinsters out of their life savings by luring them into bigamous marriages … The moment Smith had his hands on his new bride’s money, he would disappear. Usually telling her he was going out on an errand — to pick up a newspaper or buy a pack of cigarettes — he would never return. On one occasion, he brought his newlywed wife to the National Gallery of Art and, after viewing some paintings, excused himself to go to the bathroom. She never saw him — or her life savings — again. That particular bride was named Sarah Faulkner. Smith had already plundered £350 in cash from her and her jewelry as well, and while she was waiting for him to return from the loo he was back at their hotel, swiping her clothing and the rest of her money. The only wife that didn’t fit this pattern was Edith Pegler. Smith was away from her side for months at a time on “business trips” and when he returned it was always to ask for money, but he never left her for good and they remained together for seven years. As to whether he actually harbored some form of affection for her or whether he just didn’t want to kill his cash cow while it was still milkable, we can only speculate. Yet all these women were, in a sense, lucky. Smith may have broken their hearts and taken their cash, but he left them their lives. The first unlucky wife was Bessie Mundy, whom Smith murdered on July 13, 1912. They’d married in August 1910, but he left her after persuading her to give him £150 in cash. On the way out the door, he accused her of giving him a venereal disease. Eighteen months later, Bessie ran into Smith on the street. Somehow, the charmer got his ex to forgive him and resume their relationship. In fact, Smith wanted to get his hands on Bessie’s £2,500 inheritance, but it was in trust and he couldn’t touch it. After their reunion, the couple drew up mutual wills, naming each other as beneficiaries. Bessie willed her husband £2,579. Less than a week later, she was mysteriously dead. Smith rented a house for them in Herne Bay and had a new cast-iron bathtub installed. Tragically, Bessie drowned in the bath. Her husband said he’d been out buying dinner and returned to discover the body. Since Smith claimed his bride suffered from epilepsy and that she’d had a seizure the day before she died, it was easy to believe she’d simply had an unfortunate accident. In spite of his newfound wealth, Smith had Bessie consigned to a pauper’s grave and even returned the slightly-used bathtub to the ironmonger for a £1 17s. refund. This, perhaps, is where Smith might have counted himself lucky and checked out of the homicide business — or at least thought about a different m.o. Instead, hubris and habit got him hanged. The Brides of Bath murder victims: from left to right, Bessie Mundy, Alice Burnham, and Margaret Lofty. Next to go was Alice Burnham, who was making a goodly living as a nurse. Smith married on November 4, 1913, and became her widower on December 13. Alice and her new husband were honeymooning at a seaside boardinghouse in Blackpool when she drowned in the bathtub while he was supposedly out getting eggs. Smith, who claimed she had a weak heart, had insured her life for £500. She too was buried on the cheap. Margaret Elizabeth Lofty died in her London home a little over a year later, on December 18, 1914. Newspapers reported she had drowned in the bathtub while her husband — identified as Robert Lloyd — was out buying tomatoes. He and the landlady found the body. Lofty and “Lloyd” had married only the day before and, appropriately enough, the ceremony was performed in the city of Bath. Although it was initially classified as death by misadventure, Margaret’s murder ultimately lead to Smith’s downfall. Rotten luck, it was: Alice Burnham’s father read an account of her death in the newspaper and, even though the husband had a different name, he couldn’t help but notice that Margaret’s death was suspiciously similar to his daughter’s. Joseph Crossley, who was the couple’s landlord at the time of Alice’s death, noticed the same thing. Since both the Burnhams and Crossleys had taken a dislike to Smith from the get-go, they both wrote the police, asking them to open an investigation. Authorities quickly determined that George Joseph Smith and Robert Lloyd were the same man. They sure had the same playbook. Margaret had made out a will just hours before she died, naming her husband the sole heir to her estate. She had also withdrawn her life savings from the bank the same day, and three days before she had taken out a £700 life insurance policy on herself, with her husband as the beneficiary. Ka-ching. When the grieving widower showed up at the insurance office to collect on Margaret’s policy, he was arrested. Lloyd/Smith was initially charged with putting a false name on a marriage certificate, but bigamy and murder charges would follow fast. When news of the arrest was published, a police chief from Kent read the story and told the London police about Bessie Mundy’s death, which was strikingly similar to the other two. But how could he could have drowned the women in the tub, without leaving marks of violence on their body? Margaret had only a small bruise on her elbow. For answers, the police turned to renowned pathologist Bernard Spilsbury. The first thing he did was exhume the bodies to determine whether the women had, in fact, drowned. They had. With honeymoon playfulness he would enter the room where his bride was already in the bath, admire her naked beauty, bend over her fondly, and, still murmuring endearments, hold her feet. Suddenly, he would tug her feet upward, jerking her head at the end of the bath, below the water, so that in a few moments she would be drowned with no bruises on the body or other signs of assault or resistance. Effective. Actually, you can see why he stuck to his system. The judge allowed it, setting a precedent that would be used in later criminal cases. In pretrial investigations later described in court, Spilsbury demonstrated his murder theory using Bessie’s bathtub and a female police officer in a bathing suit. It worked all too well: she lost consciousness immediately and they had to drag her out of the tub and perform artificial respiration to revive her. No wonder the jury was only out for twenty-two minutes before it delivered a guilty verdict. Caroline Thornhill, Smith’s legal wife, returned to Britain for his trial. She married a Canadian soldier the day after his execution. The “Brides in the Bath” case has remained vividly alive in British memory. The historian Harold Nicholson compared Smith’s behavior to Adolf Hitler’s in his 1939 book, Why Britain is at War; Smith was mentioned in novels by Evelyn Waugh, Agatha Christie and Dorothy Sayers, and in 1952 the case was made into an episode for the true-crime radio show The Black Museum. More recently, in 2003 the murders were featured into made-for-TV movie called The Brides in the Bath. Warning: Video contains NSFW naked ladyparts. Oh, and homicide. At least two plays, Tryst and The Drowning Girls, are based on the story. In 2010, the author Jane Robins published a book about the case, called The Magnificent Spilsbury and the Case of the Brides in the Bath.